Made from polyethylene, a disposable material used for production of medical injectors, shrinking and aging, can mix with ink. Made from polycarbonate, does not shrink and age, protected from damages. Parts are pasted together and soldered at the factory. Can not be repaired or restored. The system is put together without soldering and gluing, allows making operative repair and replacement of any spare parts. The standard form, easily overturns which leads to spilling of ink. Has the original form which is patented by the manufacturer. This form strongly reduces risk of overturning CISS. CISS spills ink during transportation as corks are made of rubber which shrinks and leads to ink being poured out. Has 100 % airproof sealing in shipping position thanks to silicone stubs. Possibility of printer transportation with pre-installed and filled CISS for large distances. Made from thermoplastic, not steady to the wear and tear, which leads to ink being poured out in the printer and to high probability of breakage of printing head. Made from silicone, has sufficient length, which allows to prolong the warranty term. Chips are soldered to the cartridges, which does not allow to swap a chip with one CISS or another. Frequently requires an original cartridge for CISS functioning. Chips are made at factories, not requiring original cartridge to work. Located on the black plate, which allows to take off or set in a few seconds with one CISS or another. Very often soldered together, in case of finding holes it is necessary to change all CISS without possibility of repair. There is no possibility to change connected cartridges, the repair-prevention holes are absent in the cartridge. Made from high-quality plastic, can be easily disassembled and interchanged, which allows to swap from one model to another or replace the damaged cartridge. CISS installing requires physical changes in a printer (sawing off of partitions, making holes), which 100% deprives the customer of warranty. CISS installing is very simple and takes up 5 - 10 minutes. Installing does not change the construction of the printer, which allows to save original printer warranty. It is difficult to define the origin of photo paper, and a purchase from one vendor can be different from another. A firm photo paper, protected by company logo at the back, has superior whiteness, and belongs to А+ class. Photo paper is free in the bonus package when you purchase printer with CISS. Ink is made in China, has low color rendition and insufficient quantity of greasing substances which leads to drying of the print head. Ink is made in Korea, with developed ICC profiles for printers, all-in-one and plotters. 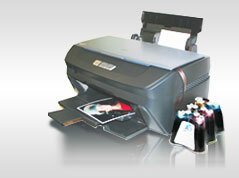 The printing head with INKSYSTEM ink does not dry up to 3th months if not using the printer.